(b. 1981 in Langley, British Columbia, Canada; lives in Vancouver) Raymond Boisjoly describes his process as “thinking through vernacular forms.” Boisjoly began the series Rez Gas as an experiment. 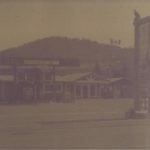 Using the most archaic method of photography—exposing a light-sensitive surface to the sun—he created on black construction paper indexical images of gas stations located on Canadian Indian reserves. 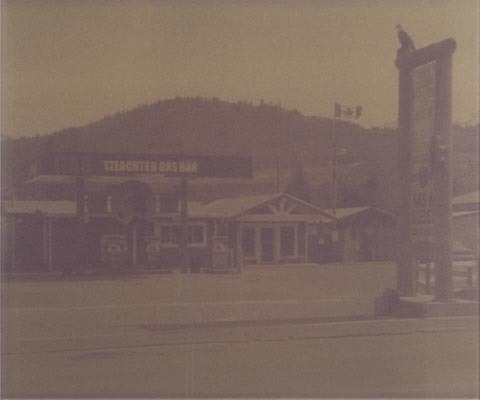 The pictures are subtle yet evocative documents of seemingly banal places, recalling Ed Ruscha’s seminal 1963 artist book Twentysix Gasoline Stations. Documenting the beauty in vernacular architecture, Boisjoly positions the filling stations as sites of cultural encounter, and stand-ins for current anxiety and conflict over petroleum resources.